From the deepest shadows of its imposing forests to the darkened alleys of its sprawling cities, danger is everywhere in the Empire. Savage greenskins, feral beastmen, insidious cultists, and the daemonic forces of Chaos work tirelessly to bring about the Empire's ruin. Brave heroes must rise to these challenges and face the threats that seek to destroy the Empire from without, as well as from within. You can become one of these brave heroes, fighting against the Empire's many enemies. Over the course of your adventures, you may earn fame, glory, wealth, and renown. Or you may die penniless in the gutter, next to the countless others who have gone before you. 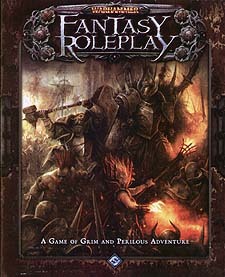 Endless excitement awaits with Warhammer Fantasy Roleplay. Combining ground-breaking roleplaying innovations with phenomenal components and design, your adventures in the Old World will be unlike anything you have experienced before.